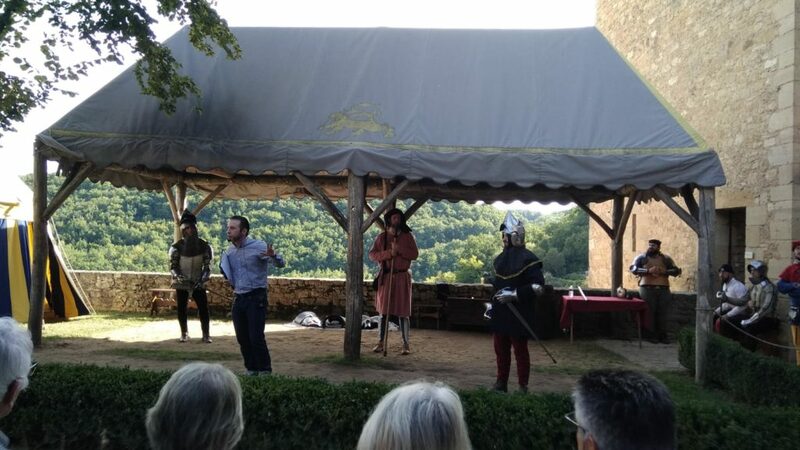 This weekend saw the realisation of a dream three years in the making: The Judgement of Mars, a medieval emprise d’armes at the gorgeous Château de Castelnaud in Southwestern France which I organised with the help of an army of amazingly talented and generous people. 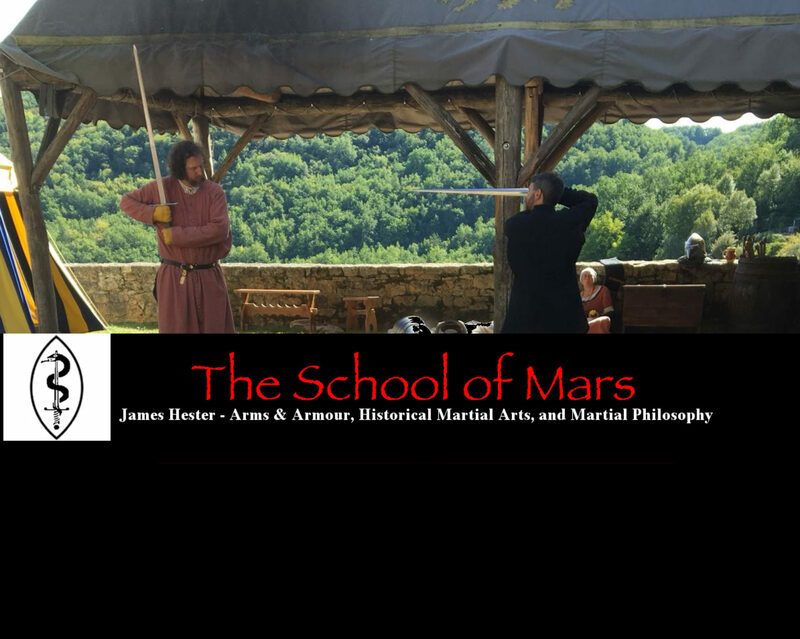 Arriving on Thursday evening, it seemed that Mars was determined to test me from the start by having the taxi from Sarlat drop me off at the base of the town, presenting me with a 15-20 minute climb up the hill, treading ancient cobble paths at 45-degree angles, with a 20kg bag of weapons and armour. But by evening’s end I was settled and already re-entranced by the singular beauty of the place. 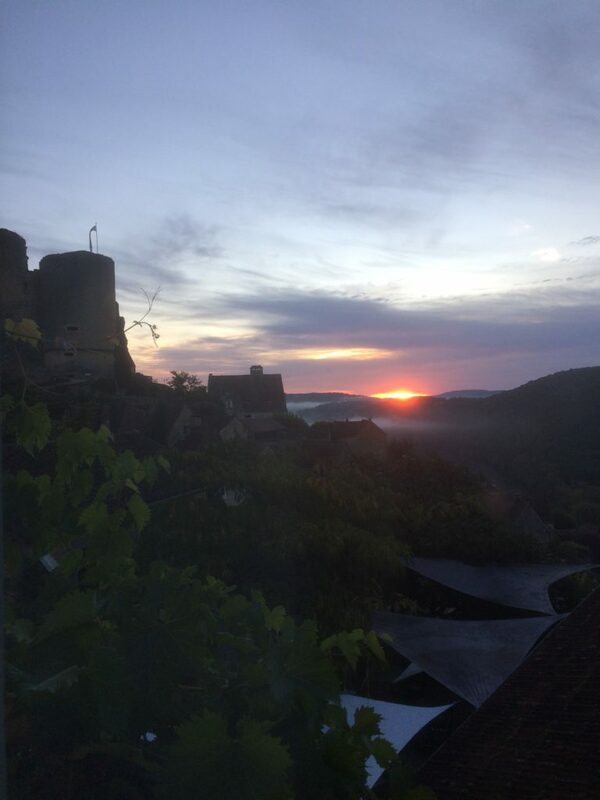 Of all the sites I visited in my three years of research, Castelnaud stands out in my mind as being the most beautiful and atmospheric. On Friday mid-day I had been invited to lunch with the Castelnaud team. There I met once again Patricia, the curator who had opened her collection to me three years earlier, and for the first time Jean-Yves, a fellow swordsman-scholar who had been so helpful in the past year working with me to coordinate people and schedules from the Castelnaud side of things. We were soon joined by Gaël, a swordmaker of superb skill who was displaying some of his work over the weekend. After a lunch filled with catching-up stories and talk of the events to come, we retired to behind the scenes where some swords for the collection had been removed for Gaël to examine. Much drooling over original medieval swords ensued, during which time we were joined by Olivier and Franck, swordsmen and specialists in the famous MS I.33 who would be presenting sword and buckler techniques for the visitors. Later, my phone pinged to tell me that the other group I was to be reunited with that day had arrived. 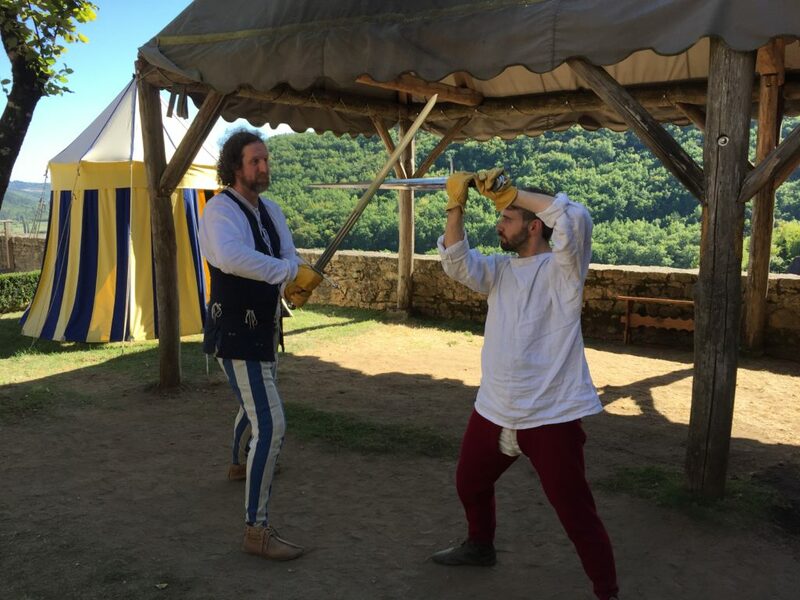 When I publicly announced the formal challenge, inviting fighters from far and wide to come and put me to the test in the lists, I was overjoyed to receive word that Stephen, one of my oldest friends who taught me much of what I know about swordsmanship today, would be making the journey from the US to cross swords with me. Even cooler, he would be accompanied by his wife Alena, another dear old friend, their son Percy, and Julie (whose coming was sprung on me by the others as a last-minute surprise), a friend from the Ren Faire days who I had not seen in about a decade. Later that day I was joined by Антон, my good friend and former Tottenham housemate who had decided to make my emprise a stop on his motorcycle adventure around Europe. 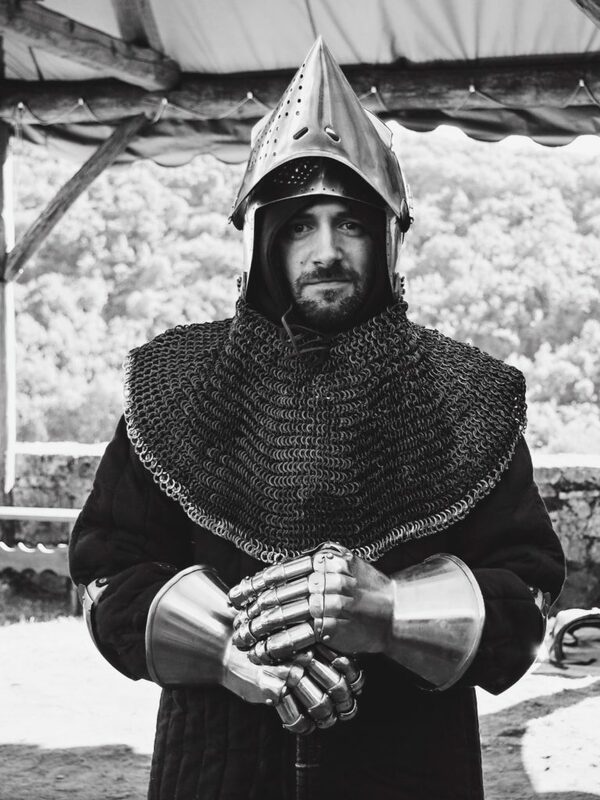 So not only would I be spending the weekend dressed in 14th century kit and swordfighting in a gorgeous medieval castle, I’d be doing it in the company of some of my closest friends. Saturday morning started early. Emerging dressed in my medieval finest, I was greeted at the communal breakfast table where I was staying by Gaël, the swordmaker I had met the day before, and Georges, an armourer who would also be showing the fruits of his considerable skill this weekend. After a breakfast filled with some intense arms and armour nerding-out, I had to head to the château for pre-event meetings. 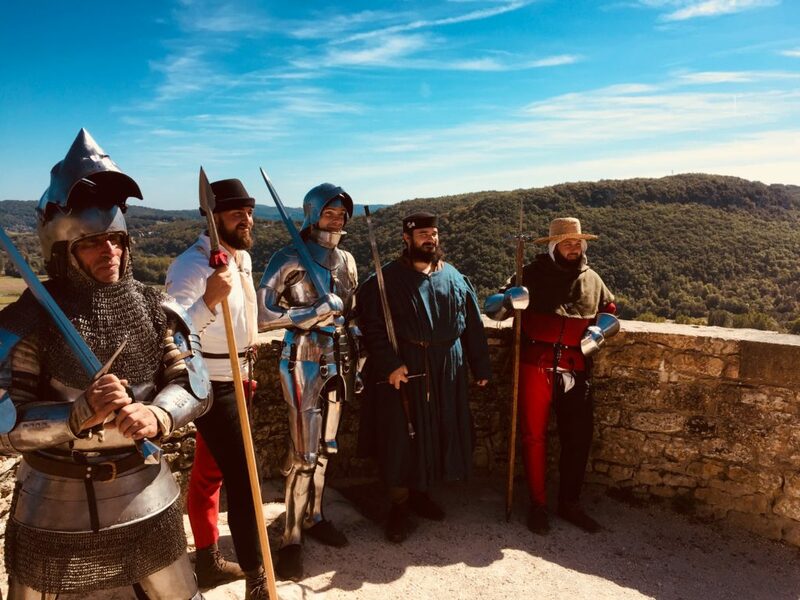 There I encountered Stephen and, at long last, the crew from La Mesnie du Blanc Castel (Damien, Thomas, Kevin, François, Manon, and Sierik), the group from Bordeaux who had answered my challenge and come to cross swords with me and also present living history displays for the visitors. 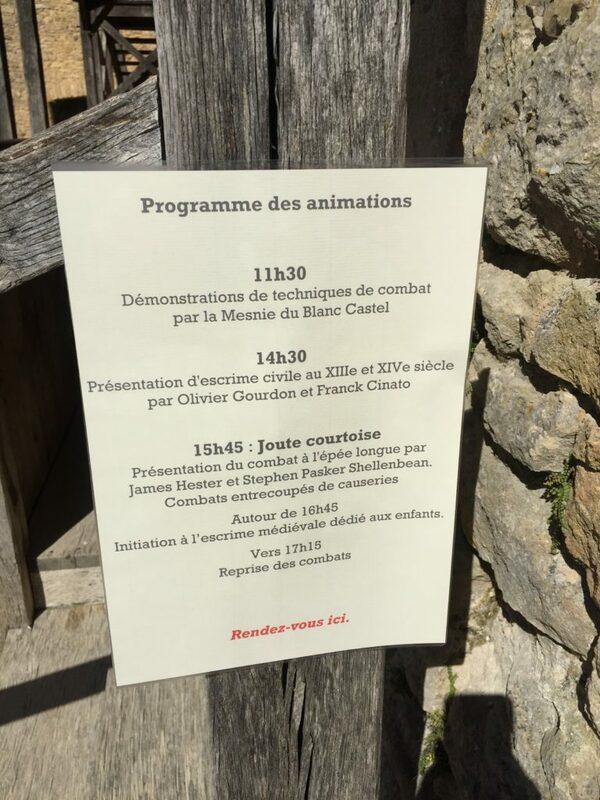 I was also introduced to Loïc, an historian and fellow reennactor who would be acting as one part herald, one part Master of Ceremonies, and one part sports commentator for the combats, as well as translating the presentation that Stephen and I were to give for the public. At long last the weekend’s offerings commenced. The presentations to the public were done with great expertise to the delight of the visitors who, despite it being at the tail end of tourist season, had come out in large numbers to see us. La Mesnie du Blanc Castel demonstrated fighting techniques with a variety of weapons, in and out of armour. Olivier and Franck’s presentation on I.33 clearly demonstrated the vast knowledge they had acquired from decades of studying this fascinating manuscript. And the introduction to the longsword given by Stephen and I (with the assistance of Loïc) was very well received and showed that, even though we wrote and planned it from opposite continents, we had worked together for so long that the results were the same as if we had rehearsed together from the start. 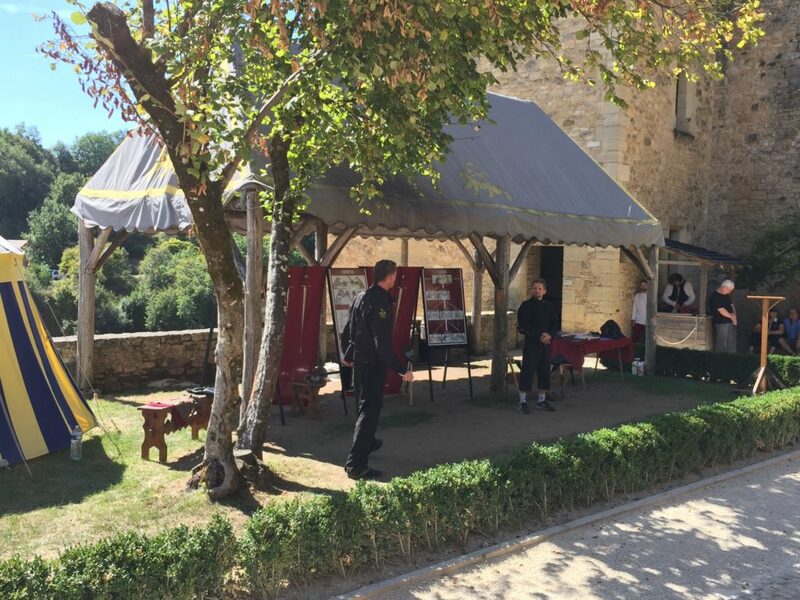 In between all of this, the Castelnaud team of Patricia, Jean-Yves, and Laetitia showed us all a level of hospitality I have never before experienced at a living history event. Throughout the day, all participants ate and drank very well, and wanted for nothing. As the afternoon came on, the main event was upon us. 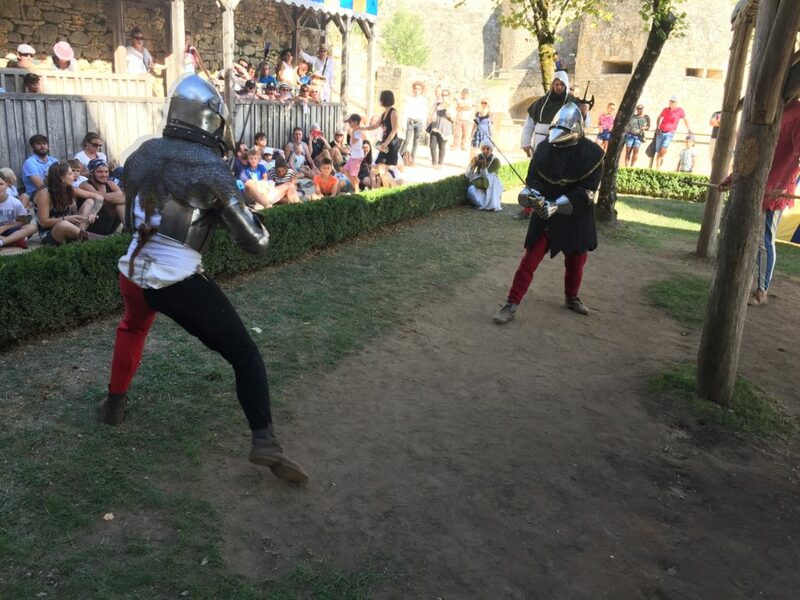 I would take the field, armed in a quilted jupon, bascinet, gauntlets, and couters (elbow protection) to test my skill against five fighters, back to back, with the longsword. I was allowed a brief break of a few minutes in between each bout to get some air and a quick drink of water, and there was an intermission half way through during which some of the younger visitors were invited into the lists where I taught them some basic sword moves. But apart from that, I was in the lists from start to finish. In each match, a total of eight successful hits would be counted out by the marshals (Stephen and Damien alternating in this role), after which the match would be ended. Winners are not declared in an emprise. What matters is that the tenan (me) makes good on his vow to meet each tenan (challenger), compete in the prescribed combat, and essentially finish the event still standing. Of chief importance is that all parties make a good showing of their skill, regardless of who scores the most successful hits. The first day of combat was in many ways quite humbling. It became clear early on that I was at something of a disadvantage. I had comparatively less experience fighting in any kind of armour at all, even the light configuration we were wearing, as well as far less experience sparring than my challengers. While it was not a complete rout, as I did manage to get some good attacks in here and there, it is safe to say that the venans taught me some hard lessons. What struck me (pun intended) was that, after each match, my opponents not only thanked me for a good fight, but even generously offered pointers and observations which would be useful in improving my technique afterwards. Despite showing no mercy on the field, it was clear that we were all brethren in arms and here to support each other in doing something that we love. It was wonderful to see such camaraderie form amongst us so quickly. With the first day at a close, our entire merry band ventured down the hill for a delicious meal. Conversation and wine flowed in equal measure, as is only fitting after a hard day’s fighting. I remember looking around the table and being deeply moved that such a diverse array of people had come together (even my wife’s friends Gregory and Lukasz who made the trip down just to cheer me on) for this event. It was a truly glorious evening. On Sunday morning, Stephen had something particularly special in store. 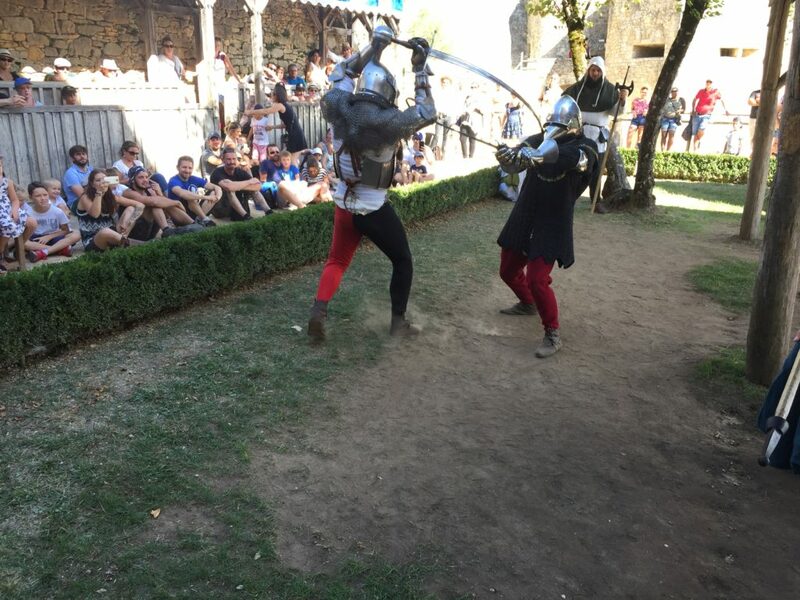 He had brought with him a drone and, with the indulgence of Patricia, we were allowed to get some amazing bird’s-eye footage of the château and the fighters in action before the public arrived. The results were stunning. It looked as though we were in a big-budget historical film. As Saturday went off without a hitch, Sunday was (at least for me) much more relaxed. The presentations were once again stellar, as were the responses from the public and the hospitality of the château team. 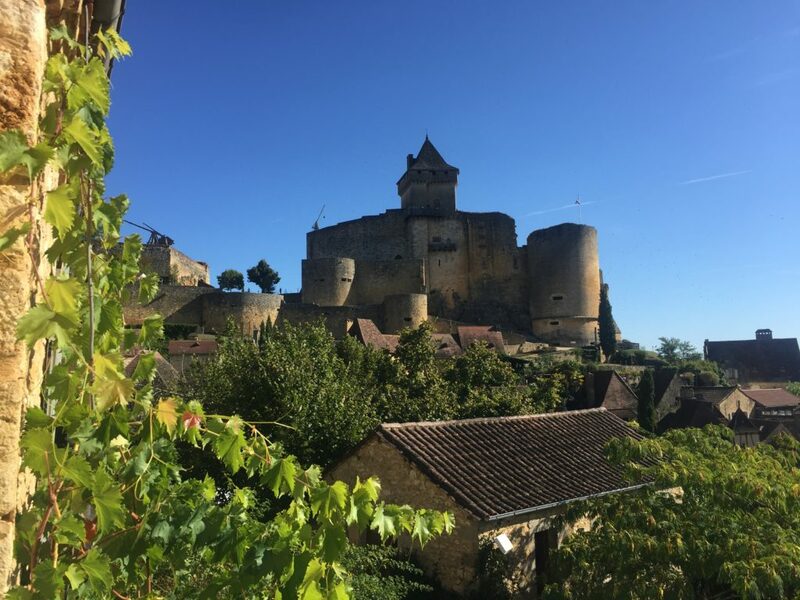 We were even granted access to parts of the château normally closed to the public, making our visit there that much more special and memorable. As the afternoon’s combat drew near, I was approached by Manon, one of the La Mesnie du Blanc Castel members who had come to assist the fighters and also take some photos. As she trained with the fighters as well, she asked if, borrowing elements of armour from her comrades, she too could take the field and participate in the challenge. I was all too happy to agree, so on the final day, I was to face six venans instead of five. I feel that I made a much stronger showing on Sunday. I had taken all the advice and observations offered by the challengers the previous day to heart. Plus, after a day of fighting, I felt a bit more at ease in my armour and had a glimpse into the individual styles of my challengers. while I still was met with stiff competition by my excellent opponents, I was satisfied that I had managed a greater number of successes myself than the day before. The spectacle was greatly enjoyed by the public. 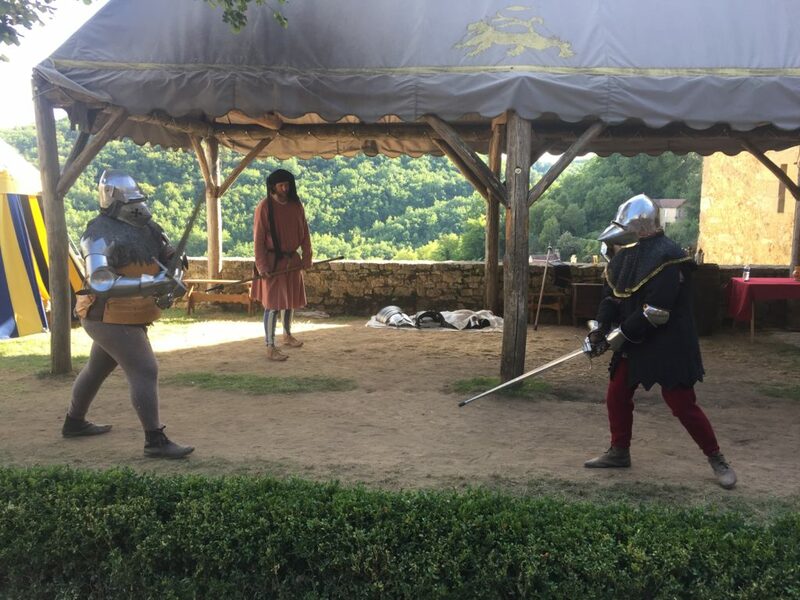 By far the highlight was the final fight against Manon, clad in breastplate, gauntlets, and bascinet over her gown, whose technical skill with a blade was clearly demonstrated during our fight. Yet finesse was won over by brute force when, after I scored a hit on her, she did not hear the marshal call the halt of fighting. 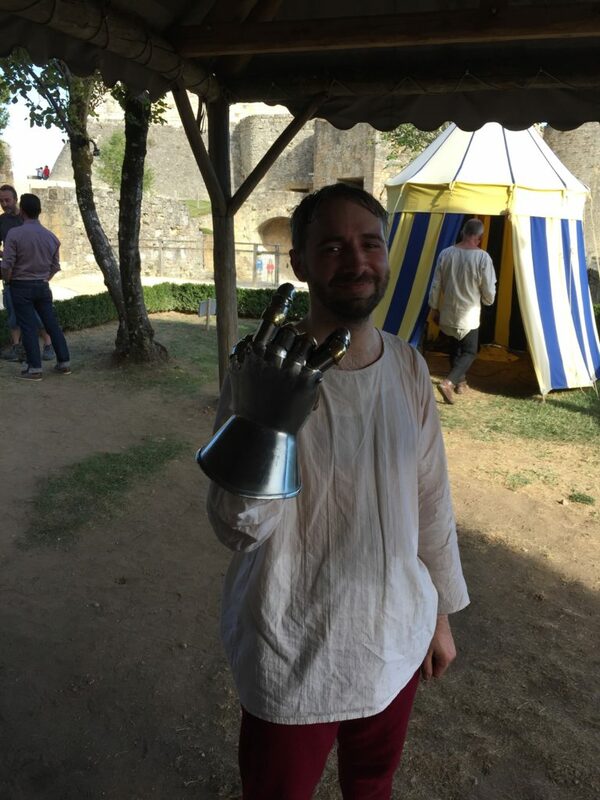 Acting purely out of reflex (for it was not an allowed technique in the combat), she proceeded to deliver a left hook to my head so strong that I felt it even through my helmet and could have sworn that she had hit me with her pommel rather than her fist. I was fine, not to worry, and I joined the crowd in erupting with cheers and laughter. The fight ended in a draw, if you were wondering. With that, the day’s combat, and the Judgement of Mars itself, had come to an end. After toasting a brilliant weekend together, we all made our farewells. In the space of a two days, we had all formed a bond that would last for years to come. The remainder of us ventured to Sarlat for a last dinner together, and as evening drew on, we went our separate ways. 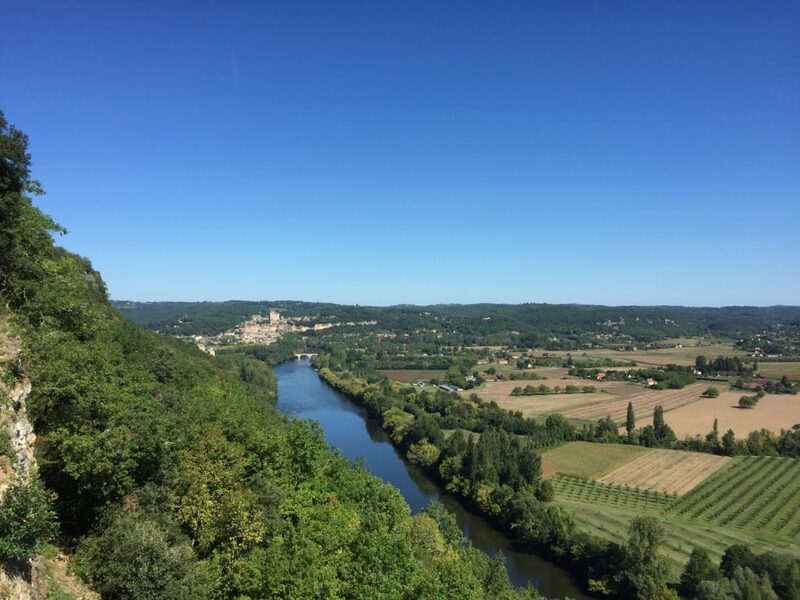 Monday was a long day of travel, taking me from Sarlat to Bordeaux (where I was met by two of my new friends from La Mesnie who generously offered to drive me to the airport after grabbing lunch together), and from there back to Britain. I arrived home late that evening, finding it hard to believe that, just earlier that day, I had been in a place of unparalleled beauty steeped in history. The lingering spell is still with me as I write this, and will likely remain with me for some time. When the first steps were taken to putting together this event three years ago, I could not have imagine it would turn out the way it did. 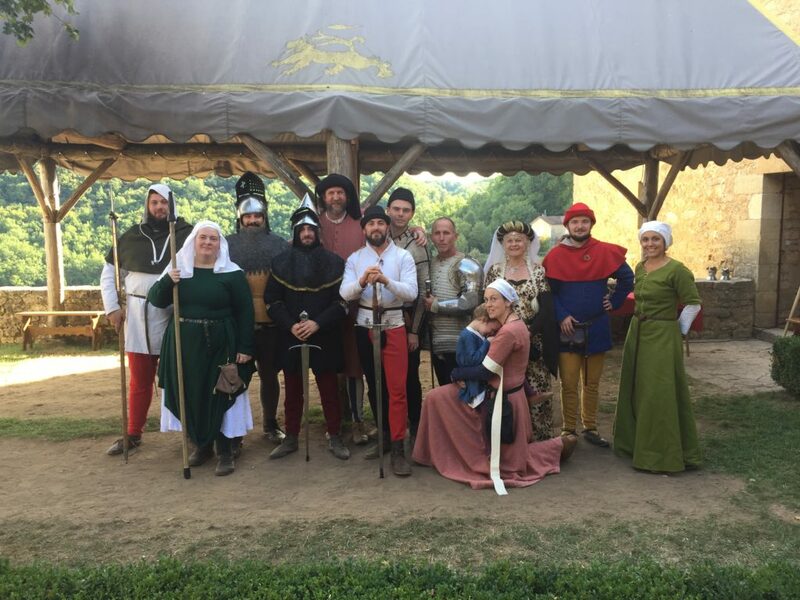 Not only did I have a unique opportunity to take part in a centuries-old tradition in a place dating from a time when such things were still in fashion, but I did so in the company of a truly extraordinary and talented group of individuals, old friends and new. It was a learning experience for me in many respects, both as a fighter and as a scholar. I have a deeper insight into my martial practice; an understanding not only of my strengths, but of my weaknesses which will only be overcome through practise and discipline. I guess you could say that Mars’ judgement could best be described as ‘Pass, but with corrections’. I remain eternally grateful to everyone who helped this weekend come to pass. Whether from fighting, presenting, inviting us in, cheering us on, or simply giving support and encouragement from afar, you all helped make The Judgement of Mars an experience that I will treasure forever.